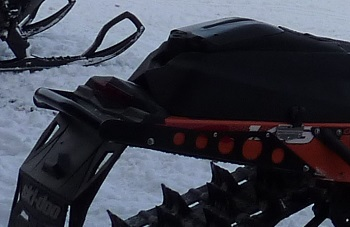 SKINZ ALL MOUNTAIN EXTREME rear bumper for Ski-doo SUMMIT REV GEN4 2017-2018 and offers more tunnel side strength, an oversize grab bar and lightweight aluminum construction. These are powder coated black and come with all mounting hardware. The 165" bumper is $35 more than the 154...why?...dunno I asked SKINZ with no answer for the .02 cents extra in material. Still a great bumper and kewl design! Please note this is a SKINZ XM NXT LVL rear bumper pic. not the actual product.